Dr Archibong Henry, a medical doctor from Cross River, Nigeria, passed through hardship after his attempt in 2007 to contest a political office left him bankrupt and stranded at point zero. Visiting The SCOAN, Dr and Mrs Archibong received the Morning Water as well as the Good Morning Sticker and their faith and conviction spurred them to conclude that God would soon turn it around for them. One night, after praying with and ministering the Morning Water, Dr Archibong encountered Prophet T.B. Joshua in his dream, taking him to the front of a large crowd where he was given the flag of Nigeria. He woke up and concluded that he needed to re-contest for political office in the upcoming elections. With no money in his pocket to run a campaign, he was surprised when well wishers raised money for him to get the nomination form. He then chose to send his campaign messages through social media, which did not cost him a dime. Barely a day to the election, he was asked by his party leaders to step down for another candidate who had the financial muscle to flex himself through the tasking processes of the election. He stepped down but was then suddenly invited to another meeting where he was informed that a mock election had been conducted and he had come out the winner. The party leaders therefore said he would be their nominee in the election, despite the fact that he did not have the necessary money to continue the process. When the election proper was conducted, he won and the electoral tribunal confirmed his victory, naming him the representative of the Itu Federal Constituency in the House of Representatives, National Assembly. The lawmaker advised people never to see distance as a barrier to blessings from God. Miss Chiazoka Chukwuma, from Enugu, Nigeria was born with sickle cell anaemia, a disease that had claimed the lives of eight of her siblings and truncated her secondary school education. She was also addicted to eating sand and charcoal. The pain she experienced was untold. After traversing several places in search of solution, Miss Chukwuma came across Emmanuel TV in her elder sister’s house. Witnessing that cases worse than hers were being tackled at The SCOAN, she decided to come for her healing. She visited and received the Morning Water which she ministered in prayer at home. Miss Chiazoka was ecstatic to notice that the pain she had been experiencing all over her body was no more. Excited about the development, she told her elder sister and decided to return to the hospital for a medical re-examination. The tests confirmed that her genotype, which was previously SS, had miraculously turned AA. She is no longer a sickle cell patient! Thanking God in company of her elder sister, she advised people to believe in God’s ability to tackle their own situations just as He has done in her case. 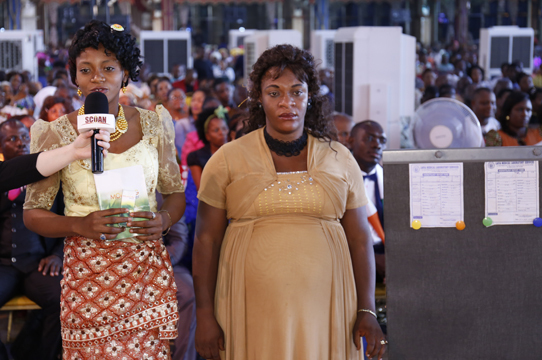 Mr Tonyekiri Biewari from Bayelsa, Nigeria, had dreamt of encountering Prophet T.B. Joshua in his dream. In that dream, the man of God gave him three cubes of sugar and told him, “Son, you are not meant to struggle in life. God has given you everything you need”. After that experience, the young man who was a contractor with an oil company and was expecting a big contract, made up his mind to visit The SCOAN where he received the Morning Water. Getting home, he gathered his family for prayers and ministered the Morning Water. Two days after returning to his base in Bayelsa, he was awarded the contract he had been running after for two years. Having been awarded the contract, Mr Biewari needed funds to execute it and called the prayer warriors at Emmanuel TV for prayer. Seven days later, he was granted a loan of sixty million naira without collateral. Within six months, he had offset the loan facility he got from the bank and now has over seven oil barges which he rents outs to oil companies. He has also been able to complete five massive homes which had previously been abandoned for many years due to lack of funds. The number of exotic cars in his garage is unimaginable. 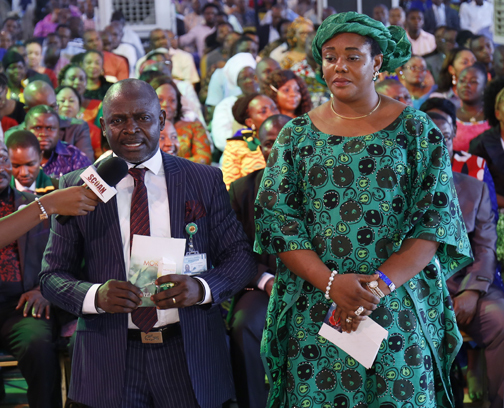 He has also embraced the spirit of giving and has given out houses and cars to both individuals and churches. 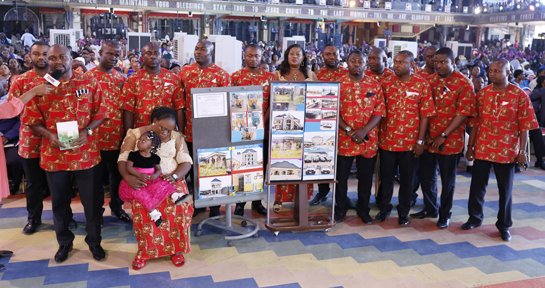 Displaying pictorial evidences of his God-inspired achievement since visiting The SCOAN, Mr Biewari, who was accompanied by members of his family, advised people never to give up on God, no matter the situation. BRETHREN, THE ONLY WAY CHRISTIAN CHARACTER GROWS IS BY FACING AND DEALING WITH DIFFICULT SITUATIONS AND PROBLEMS. BE OF GOOD CHEER – CHRIST HAS OVERCOME THE WORLD FOR US. I will see my trials ,hardships and temptations as a refiner of character and basis of my elevation and I wILL NOT GIVE THE devil A CHANCE BY THINKING THAT I am untouchable in JESUS’ NAME AMEN. This trial I am going through will surely lead me to promotion and a competitive job offer. Amen! Honestly,this is encouraging and soul lifting! Thank you very much! Indeed God is doing wonders to people. God assist all without looking at their status.The God of Prophet T. B. Joshua is Great and does things in a miraculous way. Emmanuel! i believe I am not out of touch, the ONLY God, God of Prophet TB Joshua is working to change my years of poverty, limitations, backwardness, debts, into victory, success, wealth, blessings to the less privileged in Jesus name! Indeed God is good to us may god continue to bless the man of God prophet t b Joshua for geart prayer and things he as doing in our lives in Jesus name amen. The Holy Bible is advising us that: But you are to hold fast to the Lord your God as you have until now. i am encouraging the children of God Almighty to hold fast in the Lord your God as you have forever. Because our Heavenly Father so loved the world and He gave us His only Son so that who ever believe in Him will have abundant life. Let us continue to follow our Lord and Savior Jesus Christ and love Him with all your heart and with all your soul. You ought revere Him. Keep His commands, obey Him serve Him with all your heart and all your soul, hold fast to Him and walk in all His ways. Let us hold fast to His statutes and turn your hearts towards His statutes. Love you Heavenly Father and serve Him only. For the Lord your God is God of gods and the Lord of lords, the great God mighty and awesome. He is our God who have done great things, who performed for you the great and awesome wonders. Some of the things which Lord Almighty said He will do in Deuteronomy 11:13-15 13 If you faithfully obey the commands I am giving you you today. To love the Lord your God and serve Him with all your heart and with all your soul. 14 Then I will send rain on your land in its season, both autumn and spring rains, so that you gather in your grain, new wine and oil. 15 I will provide grass in the fields for your cattle and you will eat and be satisfied. Where can we go from His Spirit? where can I flee from your presence. If you go up to the heavens, He is there. If you make your bed in the depths His is there. If you rise on the wings of the dawn. If you settle on the far side of the sea, even there His hand will guide you, His right hand will hold you fast. God Almighty created your inmost being. He knitted you together in your mother’s womb. You are wonderfully made and His works are wonderful. Lord Jesus Christ said that in John 6:47 I tell you the truth he who believes has everlasting life. He is the bread of life. There is bread that comes from down from heaven. If anyone eats of this bread he will live forever. This bread is my flesh, which I will give for the life of the world. God Almighty will save you with an everlasting salvation and your victory lasts for ever you will never be disgraced. The Holy Bible says In Isaiah 55:3 Listen now my people and come to me come to me and you will have life. i will make a lasting covenant with you and give you the blessings I promised to David. God Almighty made Him a leader and commander of nations and through Him He showed them power. I am encouraging the children of God to listen to the Lord and hold fast to the Lord because there are many things which our Lord and Savior Jesus Christ which He promised to us like what He did to David. May the good Lord Almighty bless His Word. Emmanuel-God with us. May the good Lord Almighty lavish you with the riches of His grace and may He lavish you with all wisdom and understanding. May He lavish you with His love. May He make your heart be glad and joyful in His love. May He take care of you. May He richly bless you with all of Gods blessings. May He fulfill all He has planned for you. May He give you the desires of your heart and make all your plans succeed according to His will. May He pour out His love into your heart by the Holy Spirit whom He has given you. May He fill your house with His glory. In the name of Jesus Christ.. I am a winner through Christ Jesus. Emmanuel! God is with us. Emmanuel-God with us. May the good Lord Almighty meet all your needs according to His glorious riches in Christ Jesus. May you find great delight in the love of the Lord and He will give you the desires of your heart according to His will. May He strengthen you and help you and uphold you with His righteous hand. May He satisfy your desires with good things. May He do immeasurably more than you ask or imagine, according to His power. May you enjoy good health so that all may go well with you. May He bless all the work of your hands and may He bless everything you put your hands to. In the name of Jesus Christ. Emmanuel. Sunday service was up lifting,it made me examine my thinking about the trials and difficulties I’m facing. I’m now looking at them with a different understanding,I now see the attacks/challenges are not to harm me,but to look at them as objects that separates impurities,a refiner of my character,as a builder of my character! I know and believe that my breakthrough is near,God is favoring me this year! God continue to bless prophet T.B.Joshua and the emmanuel tv team. Emmanuel-God with us. May the good Lord Almighty lavish you with the riches of His grace and may He lavish you with all wisdom and understanding. May he lavish you with His love. May He make your heart be glad and joyful in His love.May He take care of you. May He richly bless you with all of Gods blessings. May He fulfill all His promises to you. May He fulfill all He has planned for you. May He give you the desires of your heart and make all your plans succeed according to His will. May He fill your house with His glory. May He richly provide you with everything for your enjoyment. In the name of Jesus Christ. Indeed to God be the glory for what He has done and what He is doing also will do. Waoh indeed i have learnt that we shouldn’t run from our challenges instead we should face them and know how to over come them by God’s grace! Waoh indeed i ‘m blessed with these testimonies. Where can we go from His presence? No where May the good Lord Almighty richly provide you with everything for your enjoyment. May you be glad and rejoice in the love of God Almighty. May He show you the path of life and fill you with joy in His presence. May He fill your house with His glory. May He give you more than you need so that you will always have all you need for yourselves and more than enough for every good cause. May He show you and give you His incomparable riches of His grace, expressed in His kindness to you. May He richly bless you with all of Gods blessings. In the name of Jesus Christ. Emmanuel-God with us. May the good Lord Almighty teach you what is the best for you and direct the way you should go. May He meet all your needs according to His glorious riches in Christ Jesus. May you find great delight in the love of the Lord Almighty and He will give you the desires of your heart according to His will. May He strengthen you and help you and uphold you with His righteous right hand. May He satisfy your desires with good things. May He do immeasurably more than you ask or imagine according to His power. May He bless all the work of your hands and may He bless everything you put your hands to. In the name of Jesus Christ. God bless you Prophet T.B.JOSHUA for what God is using to do in the life of people. Please help me. Pray for me. I have applied online for a visit since 2012.-2014.l didn’t get a letter of invitation. My condition need urgent attention. Emmanuel-God with us. May the good Lord Almighty give you success in whatever you do according to His will. May He richly bless you with all of Gods blessings. May He satisfy you and fill you with good things. May He bless you and make you fruitful and increase your numbers. May He make you the head and not the tail, you shall be always above only and not beneath. May He bless all the work of your hands and may He bless everything you put your hands to. May He grant you abundant prosperity in every area of your life. May He strengthen you and protect you always. In the name of Jesus Christ. Emmanuel-God with us. May the good Lord Almighty richly bless you with all of Gods blessings. May He take care of you. May He fulfill all His promises to you. May He fulfill all He has planned for you. May He give you the desires of your heart and make all your plans succeed according to His will. May He pour out His love into your heart by the Holy Spirit whom He has given you. May He richly provide you with everything for your enjoyment. May He show you the path of life and fill you with joy in His presence. May He fill your house with His glory. In the name of Jesus Christ. Where can we go from His presence? No where. May the good Lord Almighty show you the path of life and fill you with Joy in His presence. May He fill your house with His glory. May you find great delight in the love of the Lord and He will give you the desires of your heart according to His will. May He show you and give you His incomparable riches of His grace, expressed in His kindness to you. May He teach you what is the best for you and direct the way you should go. May He meet all your needs according to His glorious riches in Christ Jesus. In the name of Jesus Christ. You are always right Man of God. I can not fight or stand against something that i can’t see or know about, therefor I ask God through the prayer made by His servant Prophet TB Joshua to open my eyes to enable me to see my enemies,so that i can fight a right fight. In Jesus Name. Emmanuel-God with us. May you find great delight in the love of the Lord Almighty and He will give you the desires of your heart according to His will. May the good Lord Almighty meet all your needs according to His glorious riches in Christ Jesus. May He richly bless you with all of Gods blessings. May He strengthen you and help you and uphold you with His righteous right hand. May He satisfy your desires with good things. May He do immeasurably more than you ask or imagine, according to His power. May He strengthen you and protect you all the time. May He bless all the work of your hands and may He bless everything you put your hands to. In the name of Jesus Christ. MAY THE PLAN OF GOD FOR US BE PERMANENT IN JESUS NAME. Emmanuel-God with us. May the good Lord Almighty richly bless you and make you fruitful and increase your numbers. May you be blessed in the city and blessed in the country. May He bless you when you come in and when you go out. May He give you success in whatever you do according to His will. May He grant you mercy and favor. May you find great delight in the love of God and He will give you the desires of your heart according to His will. May He lavish you with the riches of His grace and may He lavish you with all wisdom and understanding. May He make your heart be glad and joyful in His love. In the name of Jesus Christ. Emmanuel-God with us. May the good Lord Almighty lavish you with the riches of His grace and may He lavish you with all wisdom and understanding. May He make your heart be glad and joyful in His love. May He take care of you. May He richly bless you with all of Gods blessings. May He fulfill all His promises to you. May He fulfill all He has planned for you. May He give you the desires of your heart and make all your plans succeed according to His will. May He pour out His love into your heart by the Holy Spirit whom He has given you. In the name of Jesus Christ. Emmanuel Indeed God is with us. 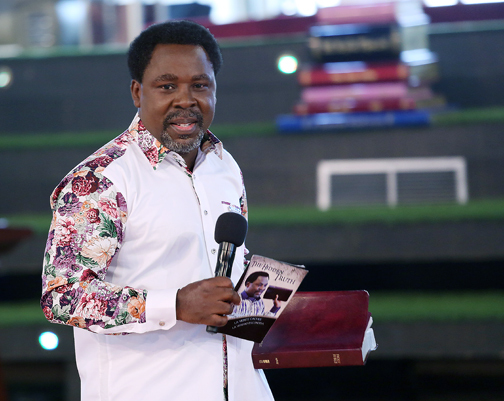 We thank the God of Prophet T B Joshua for the wonders he is doing through the whole world. Emmanuel-God with us. May the good Lord Almighty give you the desires of your heart and make all your plans succeed according to His will. May He pour out His love into your heart by the Holy Spirit whom he has given you. May He richly provide you with everything for your enjoyment. May you be glad and rejoice in the love of God Almighty. May He show you the path of life and fill you with joy in His presence. May He fill your house with His glory. May He show you and give you His incomparable riches of His grace, expressed in His kindness to you. In the name of Jesus Christ. Thank you for the food of soul you have shared us. Mr. Chernet Hailu from Ethiopia. Emmanuel-God with us. May the good Lord Almighty show you the path of life and fill you with joy in His presence. May He fill your house with His glory. May He show you and give you His incomparable riches of His grace, expressed in His kindness to you. May He teach you what is the best for you and direct the way you should go. May He meet all your needs according to His glorious riches in Christ Jesus. May you find great delight in the love of the Lord and He will give you the desires of your heart according to His will. In the name of Jesus Christ. Watching and listening to one of your recent message, during a deliverance of a man who possessed the spirit of a lion, you called some people to stand before him maybe they will not be grabbed by the possessed man. Unfortunately, they were grabbed despite the calling of the name of Jesus. But daddy, you mention a statement that, “prayer isn’t about the words you say, but by inner intuition or so”. Emmanuel-God with us. May the good Lord Almighty meet all your needs according to His glorious riches in Christ Jesus. May you find great delight in the love of God Almighty and He will give you the desires of your heart according to His will. May He strengthen you and help you and uphold you with His righteous right hand. May He keep you away from harm and watch over your life. May He satisfy your desires with good things. May He do immeasurably more than you ask or imagine, according to His power. May He lavish you with the riches of His grace and may He lavish you with all wisdom, understanding and knowledge. May He give you a wise and discerning heart, so that there will never have been anyone like you, now will there ever be. May He give you what you have not asked for, both riches and honor, so that in your lifetime you will not have equal among kings. May He take care of you. May He gave you a long and healthy life. May He keep you away from all harm and watch over your life. May He strengthen you and help you and uphold you with His righteous hand. May He do immeasurably more than you ask or imagine, according to His power. May He bless you in the city and bless you in the country. May He bless the fruit of your womb and the crops of your land and the young of your livestock, the calves of your herds and the lambs of your flocks. May He bless your basket and your kneading trough. May He bless you when you come in and bless when you go out. May He bless your barns and everything you put your hands to and may He bless all the work of your hands. May He grant you abundant prosperity in every area of your life, in the fruit of your womb, the young of your livestock and the crops of your ground. May He open the heavens, the storehouse of His bounty, to send rain on your land in season and to bless all the work of your hands. may He fulfill all His promises to you. May He fulfill all He has planned for you. May He lavish you with His love. May He pour out His love into your heart by the Holy Spirit whom He has given you. May He richly provide you with everything for your enjoyment. May you be glad and rejoice in the love of God Almighty. May He show you the path of life and fill you with joy in His presence. May He fill your house with His glory. May He show you and give you His incomparable riches of His grace, expressed in His kindness to you. May He give you success in whatever you do. May He give you the desires of your heart according to His will. In the name of Jesus Christ. Emmanuel-God with us. May the good Lord Almighty give you success in whatever you do according to His will. May He show you and give you His incomparable riches of His grace, expressed in His kindness to you. May He teach you what is the best for you and direct the way you should go. May He meet all your needs according to His glorious riches in Christ Jesus. May you find great delight in the love of the Lord and He will give you the desires of your heart according to His will. May He richly bless you with all of Gods blessings in the name of Jesus Christ. Emmanuel-God with us. May the good Lord Almighty strengthen you and help you and uphold you with His righteous right hand. May He do immeasurably more than you ask or imagine according to His power. May He grant you abundant prosperity in every area of your life and to the fruit of your womb. May He bless all the work of your hands and may He bless everything you put your hands to. May you be blessed in the city and blessed in the country. May He bless you and make you fruitful and increase your numbers. May He give you success in whatever you do according to His will. In the name of Jesus Christ. Remember my Lord, Don’t pass by me without a touch in Jesus name, AMEN. Emmanuel-God with us. May the good Lord Almighty give you success in whatever you do according to His will. May He Lavish you with the riches of His grace and may He lavish you with all wisdom and understanding. May He make your heart be glad and joyful in His love. May He take care of you. May He richly bless you with all of Gods blessings. May He fulfill all His promises to you. may He fulfill all He has planned for you. May He give you the desires of your heart and make all your plans succeed according to His will. In the name of Jesus Christ. Remember me my Lord, don’t pass by me without a touch I Jesus name, AMEN. Where can we go from His presence? No where. May the good Lord Almighty show you the path of life and fill you with joy in His presence. May He give you the desires of your heart and make all your plans succeed according to His will. May He richly provide you with everything for your enjoyment. May you be glad and rejoice in the love of God. May He fill your house with His glory. May He show you and give you His incomparable riches of His grace, expressed in His kindness to you. May He teach you what is the best for you and direct the way you should go. In the name of Jesus Christ. EMMANUEL THANK YOU JESUS FOR THIS MESSAGE. I WAS ASKING MYSELF THE WAY I’M ATTACKED SPIRITUALY. THE MAN OF GOD EXPLAINED IT. THE DEVIL TRYBY ALL MEANS TO SEPARATE US FROM GOD. BUT SOME OF THE THINGS MAN OF GOD THEY ARE VERY PAINFUL. THANK YOU JESUS FOR EVERYTHING. BLESS YOU PROPHET TB JOSHUA & YO TEAM IN JESUS NAME. AMEN. Emmanuel-God with us. May the good Lord Almighty meet all your needs according to His glorious riches in Christ Jesus. May you find great delight in the love of the Lord and He will give you the desires of your heart according to His will. May he strengthen you and help you and uphold you with His righteous right hand. May He satisfy your desires with good things. May He do immeasurably more than you ask or imagine according to His power. May He richly bless you with all of Gods blessings. May He bless all the work of your hands and may He bless everything you put your hands to. In the name of Jesus Christ. Since this last Sunday my life had moved to another level of faith, I have learnt that some of the challenges I am facing are not there to finish me, But to refine and built my character, I therefore have an understanding mind with open eyes and ears that relationship begins with God only. And i was always wandering about all drama and hardship around my life but now after the preaching of the man of God my only spiritual father T B Joshua, I have learnt that if I am in the position that God want me to be the enemy will try by all means to dislodge me and that came strongly to my understanding. Emmanuel-God with us. May the good Lord Almighty bless all the work of your hands and may He bless everything you put your hands to. May He make you the head and not the tail, you shall be above only and not beneath. May you be blessed in the city and blessed in the country. May He bless you and make you fruitful and increase your numbers. May He give you success in whatever you do according to His will. May He lavish you with the riches of His grace and may he lavish you with all wisdom and understanding. May He make your heart be glad and joyful in His love. In the name of Jesus Christ. What a blessed generation we are with Prophet T. B. Joshua and Emmanuel TV and a privilege of watching and listening to all these messages and testimonies. May all those who are able to see and hear, me included, pay more attention for the salvation of their souls in Jesus Christ’s Name. Where can we go from His presence? No where. May the good Lord Almighty show you the path of life and fill you with joy in His presence. May He fill your house with His glory. May He make your heart be glad and joyful in His love May He take care of you. May He richly bless you with all of Gods blessings. May He fulfill all His promises to you. May He fulfill all He has planned for you. May He give you the desires of your heart and make all your plans succeed according to His will. May He pour out His love into your heart by the Holy Spirit whom He has given you. In the name of Jesus Christ. Emmanuel-God with us. May the good Lord Almighty give you the desires of your heart and make all your plans succeed according to His will. May He pour out His love into your heart by the Holy Spirit whom He has given you. May He strengthen you with all power according to His glorious might and riches. May He richly provide you with everything for your enjoyment. May you be glad and rejoice in the love of God Almighty. May He show you the path of life and fill you with joy in His presence. May He fill your house with His glory. In the name of Jesus Christ. Where can we go from His presence? No where. May the good Lord Almighty show you the path of life and fill you with joy in His presence. May He fill your house with His glory. May He give you more than you need so that you will always have all you need for yourselves and more than enough for every good cause. May He show you and give you His incomparable riches of His grace, expressed in His kindness to you. May He teach you what is the best for you and direct the way you should go. May He richly bless you with all of Gods blessings. In the name of Jesus Christ. Emmanuel-God with us. May the good Lord Almighty meet all your needs according to His glorious riches in Christ Jesus. May you find great delight in the love of God and He will give you the desires of your heart according to His will. May He strengthen you and help you and uphold you with His righteous right hand. May He keep you away from all harm and watch over your life. May He satisfy your desires with good things. May He do immeasurably more than you ask or imagine, according to His power. May He richly bless you and make you fruitful and increase your numbers. In the name of Jesus Christ. Amen, God is so great, I want to see a miracle in my entire family! Emmanuel-God with us. May the good Lord Almighty bless you and make you fruitful and increase your numbers. May He give you success in whatever you do according to His will. May He grant you mercy and favour. May you find great delight in the love of God and He will give you the desires of your heart according to His will. May He lavish you with the riches of His grace and may He lavish you with all wisdom and understanding. May He lavish you with His love. May He make your heart be glad and joyful in His love. In the name of Jesus Christ. Emmanuel-God with us. May the good Lord Almighty make your heart be glad and joyful in His love. May He take care of you. May He richly bless you with all of Gods blessings. May He fulfill all His promises to you. May He fulfill all He has planned for you. May He give you the desires of your heart and make all your plans succeed according to His will. May He pour out His love into your heart by the Holy Spirit whom He has given you. May He richly provide you with everything for your enjoyment. May you be glad and rejoice in the love of God. In the name of Jesus Christ. We are in our home township in Northpart of Zambia fro Lusaka.We’r like strangers.financially broke.W can’t pay school fees for children and don’t even know the rentals will come from.However,it is men like the prophet that are an inspiretion 2 us. Emmanuel-God with us. May the good Lord Almighty richly provide you with everything for your enjoyment. May He show you the path of life and fill you with joy in His presence. May He fill your house with His glory. May He give you more than you need so that you will always have all you need for yourselves and more than enough for every good cause. May He bless all the work of your hands and may He bless everything you put your hands to. May He bless you and make you fruitful and increase your numbers. in the name of Jesus Christ. Thank you may God increase you in everything, I am so much encouraged by the preaching and testimonies. I sent a prayer request to prayer warriors in 2013/14 when i was struggling with my career . I am an accounting technician, since then I completed AAT, and graduated, got a job in a big company. I was left with 2 modules but everything is underway.I believe God for more as you continue to pray with me. Prophet T.B Joshua I salute the annointing . It took me from far and connected me to man Of God Prophet M.Socks in Botswana, the man who honours your annointing .I am blessed. Emmanuel-God with us. May the good Lord Almighty bless you and make you fruitful and increase your numbers. May He give you success in whatever you do according to His will. May He bless all the work of your hands and may He bless everything you put your hands to. May you be blessed in the city and blessed in the country. May He bless you when you come in and when you go out. May He do immeasurably more than you ask or imagine, according to His will. May He satisfy your desires with good things. May He fill you house with His glory. In the name of Jesus Christ. Emmanuel-God with us. May the good Lord Almighty do immeasurably more than you ask or imagine, according to His power. May He satisfy your desires with good things. May He strengthen you and help you and uphold you with His righteous right hand. May you find great delight in the love of God and He will give you the desires of your heart. May He lavish you with His love. May He meet all your needs according to His glorious riches in Christ Jesus. May He teach you what is the best for you and direct the way you should go. May he richly bless you with all of Gods blessings. In the name of Jesus Christ. Thank you Jesus for Prophet TB Joshua and the SCOAN family! Emmanuel-God with us. May the good Lord Almighty bless you with all of Gods blessings. May He meet all your needs according to His glorious riches in Christ Jesus. May you find great delight in the love of the Lord and He will give you the desires of your heart according to His will. May He show you and give you His incomparable riches of His grace, expressed in His kindness to you. May He give you the desires of your heart and make all your plans according to His will. May He pour out His love into your heart by the Holy Spirit whom He has given you. In the name of Jesus Christ. Emmanuel-God with us. May the good Lord Almighty strengthen you with all power according to His glorious might and riches. May He richly provide you with everything for your enjoyment. May you be glad and rejoice in the love of God Almighty. May the good lord show you the path of life and fill you with joy in His presence. May He fill your house with His glory. May He give you more than you need so that you will always have all you need for yourselves and more than enough for every good cause. May He bless everything you touch. In the name of Jesus Christ. Emmanuel-God with us. May the good Lord Almighty show you and give you His incomparable riches of His grace, expressed in His kindness to you. May He richly bless you with all of God blessings. May He teach you what is the best for you and direct the way you should go. May He meet all your needs according to His glorious riches in Christ Jesus. May you find great delight in the love of God Almighty and He will give you the desires of your heart according to His will. May He show you the path of life and fill you with joy in His presence. May He fill your house with His glory. In the name of Jesus Christ. Where can we go from His presence? No where. May the good Lord Almighty show you the path of life and fill you with joy in His presence. May He fill your house with His glory. May He give you more than you need so that you will always have all you need for yourselves and more than enough for every good work. May you be glad and rejoice in the love of God Almighty. May He richly provide you with everything for your enjoyment. May He give you the desires of your heart and make all your plans succeed according to His will. May He pour out His love into your heart by the Holy Spirit whom He has given you. In the name of Jesus Christ. Emmanuel-God with us. May the good Lord Almighty grant you abundant prosperity in every area of your life, in the fruit of your womb, the young of your livestock and the crops of your ground. May He bless everything you put your hands to and may He bless all the work of your hands. May He make you the head and not the tail you shall be above only and not beneath. May you be blessed in the city and blessed in the country. May He bless you and make you fruitful and increase your numbers. May you be blessed when you come in and blessed when you go out. May He satisfy your desires with good things. May He do immeasurably more than you ask or imagine, according to His power. May He take care of you. May He strengthen you and help you and uphold you with His righteous right hand. May He keep you away from all harm and watch over your life. May He give you a happy and a healthy long life. May you enjoy good health so that all may go well with you. May He strengthen you and protect you all the time. May He meet all your needs according to His glorious riches in Christ Jesus. May you find great delight in the love of God and He will give you the desires of your heart according to His will. May He show you and give you His incomparable riches of His grace, expressed in His kindness to you. May He fill your house with His glory. May you be glad and rejoice in the love of God Almighty. May He lavish you with His love. May He richly provide you with everything for your enjoyment. May He give you the desires of your heart and make all your plans succeed according to His will. May He strengthen you with all power according to His glorious might and riches. May He richly bless you with all of Gods blessings. May He bless the fruit of your womb and the crops of your land and the young one of your livestock, the calves of your herds and the lambs of your flocks. May He bless your basket and your kneading trough. May He fulfill all His promises to you. May He fulfill all He has planned for you. May He lavish you with the riches of His grace and may He lavish you with all wisdom, knowledge and understanding. May He give you a wise and discerning heart, so that there will never have been anyone like you, nor will there ever. May He give you what you have not asked for, both riches ans honor, so that in your life time you will have no equal among kings. May He give you success in whatever you do. May the grace of the Lord and the fellowship of the Holy Spirit and the love of Christ be with you now and forever. In the name of Jesus Christ. DEAR GOD “EMMANUEL” GOD IS WITH US? To God be the glory. The devil will be tramped from all sides . We thank you Jesus Christ. Emmanuel-God with us. May the good Lord Almighty strengthen you and help you and uphold you with His righteous right hand. May He do immeasurably more than you ask or imagine, according to His power that is at work within you. May He meet all your needs according to His glorious riches in Christ Jesus. May you find great delight in the love of the Lord and He will give you the desires of your heart according to His will. May He show you and give you His incomparable riches of His grace, expressed in His kindness to you. In the name of Jesus Christ. Emmanuel-God with us. May the good God Almighty richly bless you with all of Gods blessings. May He fulfill all His promises to you. May He fulfill all He has planned for you. May He take care of you. May He give you more than you need so that you will always have all you need for yourselves and more than enough for every good cause. May He strengthen you with all power according to His glorious might and riches. May He richly provide you with everything for your enjoyment. May you be glad and rejoice in the love of God Almighty. May He fill your house with His glory. In the name of Jesus Christ. We are indeed arrested. We need to live by LOVE. Let those who despise others continue being imprisoned. Emmanuel-God with us. May the good Lord Almighty richly provide you with everything for your enjoyment. May you be glad and rejoice in the love of God Almighty. May He grant you abundant prosperity in every area of your life. May He richly bless you and your family with all of Gods blessings. May He bless all the work of your hands and may He bless everything you put your hands to. May He make you the head and not the tail, you shall be above only and not beneath. May you be blessed when you go out and when you come in. May you be blessed in the city and blessed in the country. May He give you success in whatever you do according to His will. May He meet all your needs according to His glorious riches in Christ Jesus. In the name of Jesus Christ. Emmanuel-God with us. May the good Lord Almighty meet all your needs according to His glorious riches in Christ Jesus. May He strengthen you and help you and uphold you with His righteous right hand. May He bless all the work of your hands and may He bless everything you put your hands to. May He bless you and make you fruitful and increase your numbers. May He give you success in whatever you do according to His will. May He fill your house with His glory. In the name of Jesus Christ. wow…. i just read the message about us Christians that we should not feel out of touch….. and felt Gods love upon my life…. thank you for motivating me… may the grace of God be upon you always…..
Emmanuel-God with us. May the good Lord Almighty strengthen you, help you and uphold you with His righteous right hand. May He meet all your needs according to His glorious riches in Christ Jesus. May you find great delight in the love of the Lord and He will give you the desires of your heart according to His will. May He teach you what is the best for you and direct the way you should go. May you find great delight in the love of the Lord and He will give you the desires of your heart according to His will. May He teach you what is the best for you and direct the way you should go. May He richly bless you and your family with all of Gods Blessings. In the name of Jesus Christ. Emmanuel-God with us. May the good Lord Almighty richly provide you with everything for your enjoyment. May you be glad and rejoice in the love of God Almighty. May He give you the desires of your heart and make all your plans succeed according to His will. May He pour out His love into your heart by the Holy Spirit whom He has given you. May He strengthen you with all power according to His glorious might and riches. May He richly bless you and your family with all of Gods blessings. May He fulfill all His promises to you. May He fulfill all He has planned for you. May He take care of you. May He fill your house with His glory. In the name of Jesus Christ. Emmanuel-God with us. May the good Lord Almighty take care of you. May He fulfill all His promises to you. May He fulfill all He has planned for you. May you be glad and rejoice in the love of God Almighty. May He continue to show you the path of life and fill you with joy in His presence. May He bless all the work of your hands and may He bless everything you put your hands to. May you be blessed in the city and blessed in the country. May He give you success in whatever you do according to His will. May He make you the head and not the tail.you shall be above only and not beneath. May He do immeasurably more than you ask or imagine, according to His power. May you be glad and rejoice in the love of God. In the name of Jesus Christ. Where can we go from His presence? No where. May the good Lord Almighty meet all your needs according to His glorious riches in Christ Jesus. May He richly bless you with all of Gods blessings. May He strengthen you, help you and uphold you with His righteous right hand. May He do immeasurably more than you ask or imagine, according to His power. May He satisfy your desires with good things. May He give you success in whatever you do according to His will. May He bless all the work of your hands and may He bless everything you put your hands to. May He richly provide you with everything for your enjoyment. May you rejoice and be glad in the love of God Almighty. May He fill the arena of liberty with His glory. In the name of Jesus Christ. Emmanuel-God with us. May the good Lord Almighty lavish you with the riches of His grace and may He lavish you with all wisdom and understanding. May He make your heart be glad and joyful in His love. May He take care of you. May He richly bless you and your family with all of Gods blessings. May He fulfill all His promises to you. May He fulfill all He has planned for you. May He give you the desires of your heart and make all your plans succeed according to His will. May He richly provide you with everything for your enjoyment. May you be glad and rejoice in the love of God Almighty. May He show you the path of life and fill you with joy in His presence. May He fill your house with His glory. May He give you more than you need so that you will always all you need for yourselves and more than enough for every good cause. May He richly provide you with everything for your enjoyment. In the name of Jesus Christ. Emmanuel-God with us. May the gracious Lord Almighty meet all your needs according to His glorious riches in Christ Jesus. May you find great delight in the love of the Lord and He will give you the desires of your heart according to His will. May He strengthen you, help you, and uphold you, with His righteous right hand. May He do immeasurably more than you ask or imagine, according to His power. May He bless all the work of your hands and may He bless everything you put your hands to. May you be blessed in the city and blessed in the country. May He bless you and make you fruitful and increase your numbers. May He satisfy you and fill you with good things. In the name of Jesus Christ. May the gracious Lord Almighty fulfill all His promises to you. May He fulfill all He has planned for you. May He take care of you. May He give you the desires of your heart and make all your plans succeed according to His will. May He pour out His love into your heart by the Holy Spirit whom He has given you. May He richly provide you with everything for your enjoyment. May He show you the path of life and fill you with joy in His presence. May He give you more than you need so that you will always have all you need for yourselves and more than enough for every good cause. May He richly bless you and make your fruitful and increase your numbers according to His will. In the name of Jesus Christ. Daniel 7:18 But the saints of the Most High shall receive the kingdom and possess the kingdom forever even forever and ever. The Holy Bible is advising us that: The saints, the children of the loving Heavenly Father and God’s holy people shall receive the kingdom and they will have the kingdom forever and ever. Since you are children of the Most High God you are heirs – heirs of God and co-heirs with Jesus Christ because you share in His glory. You are the children of His inheritance an inheritance that can never perish, spoil or fade kept in heaven for you. You were bought at a special and precious price. In the Book Psalms 146:5-6 5 Happy is he who has the God of Jacob for his help. Whose hope is in the Lord his God. 6 Who made heaven and earth, the sea and all that is in them. Who keeps truth forever. We are advised that the Psalmist was saying that: It is a great blessing for children of God to have the God of Jacob to help them. They depend on the awesome Lord Almighty their God who reigns forever and ever. He made heaven and earth, He made the sea and everything in it. He can be trusted to do what He says and He is faithful. He is wonderfully good. He is good and abounding in love. He is awesome in glory. He is the high priest of good things. He satisfies your desires with good things. There is no good thing that He withhold from His children. He gives generously good things to His children. His Living Word is beautiful and wonderful Word of Life and it is Good News. The good Lord Almighty will bless you in the city and He will bless you in the country. He will bless you when you come in and He will bless you when you go out, He will make you the head you shall be above only and not beneath. I want to use this opportunity to thank His anointed servant for the powerful and wonderful prayers, teaching, preaching and prophesying to the viewers and in the Arena of Liberty and also to thank you for the Morning Water and Morning Sticker. Thank you for your lovingkindness. Thank you for all what you have done to the children of God. Thank you for your mercy and favor. Many children of God are testifying to the goodness of the Lord in their lives. I appreciate. The good Lord Almighty will richly reward you. He will increase you a thousand times more and bless you as He promised. He will do exceedingly abundantly above all that you ask or think according to His power that is at work within you. He will make your heart be glad and joyful in His love. He will give you the desires of your heart and make all your plans succeed according to His will. He will strengthen you with all power according to His glorious might and riches. He will strengthen you, help you and uphold you with His righteous right hand. He will give you success in everything you do according to His will. For everyone who has will be given more and He will have an abundance. Make a tree good and its fruit will be good. The gracious Lord Almighty will show you the path of life and fill you with joy in His presence. Blessed are the people whose God is the Lord. In the Book of Romans 8:31-32 31 What then shall we say to these things? If God is for us who can be against us? 32 He who did not spare His own Son, but delivered Him up for us all, how shall He not with Him also freely give us all things? We are advised that: Apostle Paul sent and Epistle to the Romans saying that: So what should we say about this? If God is for us no one can stand against you. And God is with you. He who did not spare His own Son but delivered Him up for us all. The Most High God gave His Son for all of us. So now with Jesus Christ. God will surely give you all things. In the Book of Ephesians 2:10 For we are His workmanship created in Christ Jesus for good works, which God prepared beforehand that we should walk in them. We are advised that: You are God’s workmanship created in Christ Jesus to do good works which God prepared in advance for you to do. The gracious God Almighty will grant you abundant prosperity in every area of your life. He will lavish you with the riches of His grace and He will lavish you with wisdom, knowledge and understanding. He will give you a wise and discerning heart so that there will never have been anyone like you nor will there ever be. He will give you both riches and honor so that in your lifetime you will have no equal among leaders. In the Book Book of Philippians 4:19 And my God shall supply all your need according to His riches in glory by Christ Jesus. We are advised that the glorious God Almighty shall supply all your need according to His riches in glory by Christ Jesus. You can do all things through Christ who gives you strength. In the Book of John 15:15-17 15 No longer do I call you servants; for a servant does not know what his master is doing but I have called you friends for all things that I heard from My Father I have made known to you. 16 You did not choose Me, but I chose you and appointed you that you should go and bear fruit and that your fruit should remain, that whatever you ask the Father in My name He may give you. 17 These things I command you, that you love one another. We are advised that Lord Jesus Christ said that: I no longer call you servants, because a servant does not know his masters business. Instead I have called you friends for everything that I learned from My Father I have made known to you. You did not choose me, but I chose you and appointed you to go and bear fruit – fruit that will last. Then the Father will give you whatever you ask in my name. This is my command love each other. Love the Lord will all your heart, with all your strength, with all your mind and with all your soul. Because everything about Lord Jesus Christ and our Heavenly Father is good and everything about Them is great. In the Book of 2 Corinthians 2:14 Now thanks be to God who always leads us in triumph in Christ and through us diffuses the fragrance of His knowledge in every place. We are advised that Apostle Paul sent a Second Epistle to the Corinthians giving thanks to the Heavenly Father saying that: But thanks be to God who always leads us in victory through Jesus Christ. God uses you to spread His knowledge everywhere like a sweet smelling perfume. May the grace of the Lord and the fellowship of the Holy Spirit and the love of Christ be with Prophet T. B. Joshua, Evangelist Mrs. Evelyn Joshua, The SCOAN And Emmanuel TV Patners, the children in the Lord and the children of God now and forever. In the name of Jesus Christ.